Building upon its EIP RMC status and its core role in EIT Raw Materials, METGROW+ develops an industrially viable, flexible “New Metallurgical Systems” Toolbox, which consists of a broad range of already existing and newly developed “metallurgical unit operations”. The unit operations follow a value-chain approach, from pre-treatment, to metal extraction, metal recovery and (residual) matrix valorisation. The industrially-driven, interdisciplinary METGROW+ consortium involves all relevant stakeholders along the value chain, from the (upstream) pretreatment to the final (downstream) residual matrix valorisation in building materials. (2) The development of several new metallurgical unit operations (incl. bio-, solvo- and plasma operations). 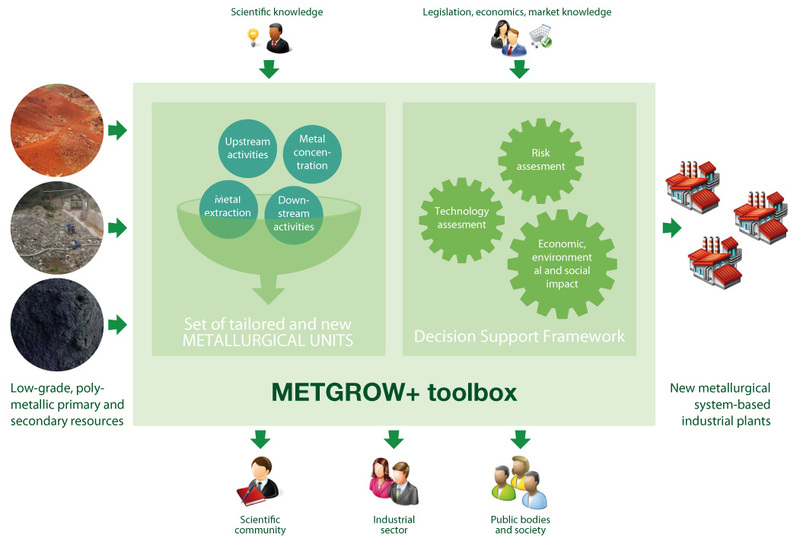 METGROW+ demonstrates and validates the New Metallurgical Systems Toolbox for a multitude of low-grade resources in the EU-28. (4) Fayalitic slags from non-ferrous metallurgy. The metals valorised from these sources include both economically important metals (Ni, Zn, Cu) and critical metals (In, Ga, Ge, Sb, Co and Cr). Subsequently to the project and in cooperation with EIT Raw Materials, the “New Metallurgical Systems” toolbox is deployed far beyond the EU Member States directly involved in METGROW+, leading to improved competitiveness and new jobs in the metallurgical and downstream industries, while achieving the objectives of the EIP on Raw Materials.